Vitamin K -dependent protein carboxylation is a process that involves all tissues and regulates processes like coagulation, apoptosis, signal transduction and arterial calcification. The reaction takes place in the endoplasmic reticulum leading to the formation of GLA domains, rich in gamma-carboxyglutamate (Gla), in the target proteins. Hypothetical model of the vitamin K-dependent γ-carboxylation system. VKCFD1 (for combined deficiency of vitamin K-dependent coagulation factors) that is associated with serious bleeding. how the secretory machinery impacts carboxylation, which occurs in the endoplasmic reticulum during vitamin K-dependent protein secretion. 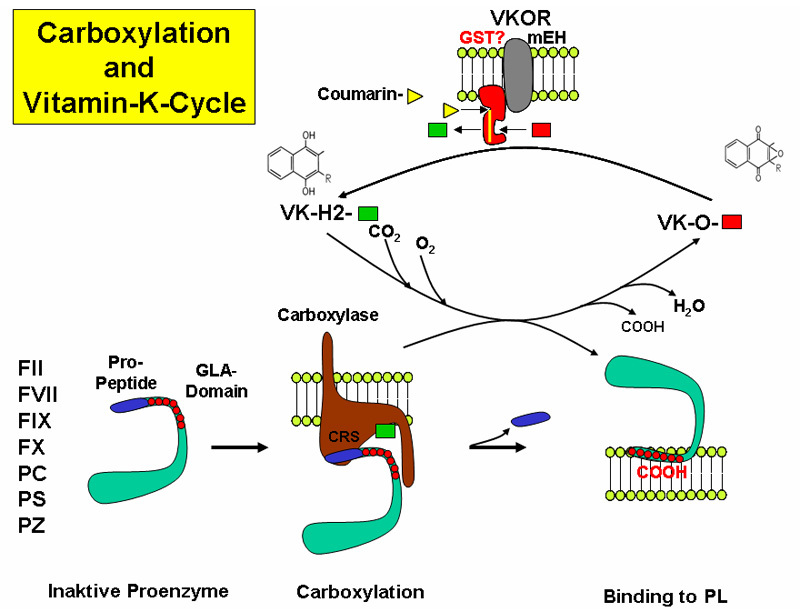 VKOR and the carboxylase, which are both integral membrane proteins, exist in a complex to cycle vitamin K ? Quinones with a redox potential exceeding that of vitamin K1 (eg Ubiquinone10 = E(mv) 122) , showed strong inhibition of the KH 2 mediated carboxylation reaction, whereas the anthraquinone derivative (eg Menadione = E(mv) 2), with a relatively low redox potential, had no effect. Human UBIAD1 localizes to mitochondria and converts vitamin K1 to vitamin K2. Vitamin K2 is best known as a cofactor in blood coagulation, but in bacteria it is a membrane-bound electron carrier. Whether vitamin K2 exerts a similar carrier function in eukaryotic cells is unknown. We identified Drosophila UBIAD1/Heix as a modifier of pink1, a gene mutated in Parkinson’s disease that affects mitochondrial function. We found that vitamin K2 was necessary and sufficient to transfer electrons in Drosophila mitochondria. Heix mutants showed severe mitochondrial defects that were rescued by vitamin K2, and, similar to ubiquinone, vitamin K2 transferred electrons in Drosophila mitochondria, resulting in more efficient adenosine triphosphate (ATP) production. Thus, mitochondrial dysfunction was rescued by vitamin K2 that serves as a mitochondrial electron carrier, helping to maintain normal ATP production. Recently, we have demonstrated that vitamin K2 also serves as a ligand for SXR and activation of SXR by vitamin K2 suppressed proliferation and motility of hepatocellular carcinoma (HCC) cells. The role of vitamin K in activation of gla-proteins. Vitamin K serves as a co-factor of activation of blood coagulation factors and matrix gla-protein (MGP) by γ-glutamyl carboxylase encoded by the GGCX gene. 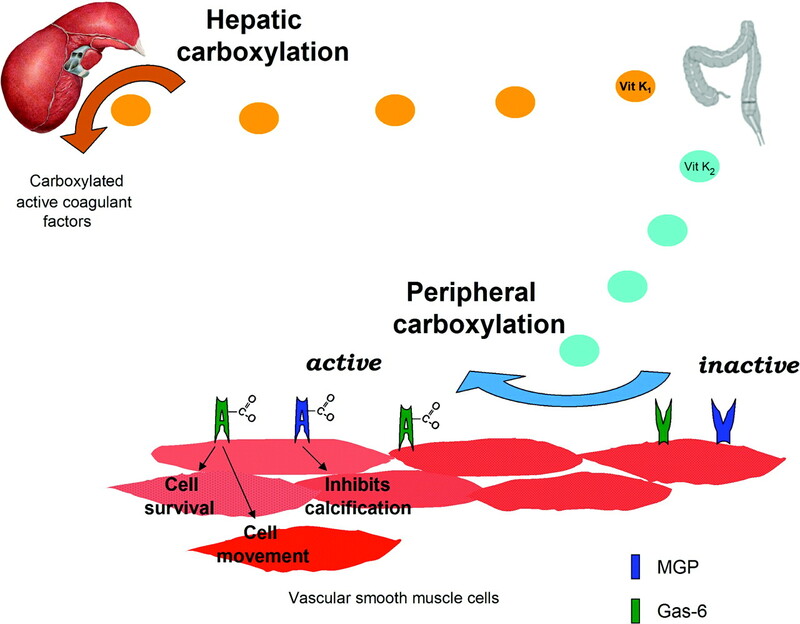 The γ-glutamyl carboxylase activates coagulation factors (Glu → Gla); the carboxylated forms are secreted into circulation from hepatocytes and are required for normal blood coagulation (lower panel). In peripheral connective tissue cells, such as fibroblasts, similar activation of uncarboxylated MGP (ucMGP) normally takes place resulting in carboxylated matrix gla-protein (cMGP), which is required for prevention of unwanted mineralization of peripheral tissues under normal calcium and phosphate homeostatic conditions (upper panel). It has been postulated that ABCC6 serves as a transporter molecule transporting vitamin K derivatives, such as the reduced form (KH2) conjugated with glutathione (GSH). In the absence of ABCC6 transporter activity in PXE, the specific vitamin K co-factor concentrations in the serum and in fibroblasts are reduced, resulting in deficient activation of MGP and allowing ectopic mineralization in the adjacent connective tissue to take place. Common pathogenetic mechanisms in vascular calcification and osteoporosis. BMPs participate in osteoblasts differentiation while they simultaneously produce ROS and increase the adhesiveness of monocytes on the vascular wall. Their action is blocked by MGP, a vitamin K-dependent protein, which also inhibits vascular mineralization as a co-factor of α-2-HS-glycoprotein (also known as fetuin-A). RANKL is a key factor of osteoclast maturation and also acts as an anticalcifying molecule. OPG prevents the interaction of RANKL with its receptor. Wnt signaling, which is important for osteoblast differentiation, is inhibited by sclerostin and DKK-1. On the vascular wall, Wnt is upregulated by the transcription factor MSX2, which blocks the inhibitory effect of DKK-1, resulting in increased vascular calcification. Phosphate, which penetrates the SMC wall through the Pit-1 co-transporter, directly stimulates vascular calcification whereas pyrophosphate acts as an inhibitor of calcification. OPN binds calcium and hydroxyapatite ions, thereby inhibiting crystal formation and vascular calcification; it interacts with integrin receptors resulting in osteoclast activation. PTH inhibits osteoblast activation and increases bone resorption; via PKA activation it induces osteoblastic differentiation and mineralization of vascular cells. Vitamin D increases the entry of calcium into vascular cells, resulting in calcification. Oxidized LDL cholesterol induces the expression of potent mediators of osteoclastic differentiation. Finally, angiotensin II participates in osteoclast activation. Abbreviations: BMP, bone morphogenetic protein; Ca2+, calcium; DKK-1, Dickkopf-1; E-NPP1, ectonucleotide pyrophosphatase/phosphodiesterase family member 1; M-CSF, macrophage-colony stimulating factor 1; MGP, matrix Gla protein; OPG, osteoprotegerin; OPN, osteopontin; Pi, inorganic phosphate; PPi, pyrophosphate; PKA, protein kinase A; PTH, parathyroid hormone; PTH1R, parathyroid hormone 1 receptor; RANKL, receptor activator of nuclear factor κB ligand; ROS, reactive oxygen species; RUNX2, runt-related transcription factor 2; SMC, smooth muscle cell; TRAP, tartrate-resistant acid phosphatase type 5. Vitamin K was first discovered in the early 1930s by the Danish biochemist Henrik Dam who observed – while studying cholesterol metabolism in chickens – that chicks fed with a diet free of sterols and low in fat tended to develop subcutaneous and intramuscular haemorrhages. Further studies on different foods led to the discovery of an "anti-haemorraghic factor", which was designated vitamin K (with the "K" standing for "Koagulations-Vitamin") given that it was essential for normal haemostasis. The term vitamin K actually denotes a group of lipophilic, hydrophobic vitamins that belong to the class of 2-methyl-1,4-naphthoquinone derivatives. All the members of the vitamin K group share a common methylated naphthoquinone ring structure, but have different aliphatic side chains attached at the 3-position. The naturally occurring compounds are vitamin K1 (also known as phylloquinone, phytomenadione or phytonadione), and vitamin K2 (also known as menaquinone or menatetrenone). The former compound is the primary source of vitamin K in humans. It is acquired through the diet and is prevalently present in leafy green vegetables such as spinach, Swiss chard, Brassica (e.g. cabbage, kale, cauliflower, turnip, and Brussels sprout), some fruits such as avocado, banana and kiwi, as well as in some vegetable oils, especially soybean oil. Interestingly, cooking does not remove significant amounts of vitamin K from these foods. Many bacteria that colonise the human intestine (especially Bacteroides) synthesise vitamin K2 or menaquinone, which is used as a redox reagent in electron transport and oxidative phosphorylation. There is, however, ongoing debate on whether bacterial synthesis of vitamin K in the intestine provides a significant supply of this vitamin in humans. The colon contains a large reservoir of bacterial vitamin K2 (~2 mg), but it is now undeniable that this pool represents only about 10% of normal human requirements and is, therefore, insufficient to satisfy these requirements. Furthermore, there is some evidence of poor bioavailability of this intestinal source of vitamin K. Bile salts are necessary for effective absorption of vitamin K, but are not present in the colon, and the intestinal synthesis of vitamin K is not sufficient to compensate for deficiency due to biliary obstruction. Moreover, intestinal menaquinones are enveloped within the bacterial membranes and are, therefore, poorly available for intestinal adsorption. Taken together, these data argue against the concept of the colon as a significant source of vitamin K for human use, so that patients at risk of deficiency remain those who cannot absorb vitamin K from the small intestine. •	Fasting vitamin K1 reference values in healthy adults range from 0.15 to 1.0 μg/L (median 0.5 μg/L). •	The average liver storage pool of phylloquinone in adults is around 9 μg, but might vary widely on an inter-individual basis. •	The liver, moreover, contains a larger pool of vitamin K2 (~90% of total liver vitamin K stores) which, therefore, represents a reservoir against vitamin deficiency when the more labile vitamin K1 stores are depleted. Other extra-hepatic tissues, especially the brain, kidney, and pancreas, store additional amounts of vitamin K2 (usually <2 pmol/g), which probably originates from endogenous synthesis through the metabolism of vitamin K.
•	Isotopic studies are consistent with a high turnover rate of vitamin K1, in that up to 70% of the oral dose is excreted in the bile and urine within a few days. According to the U.S. Institute of Medicine, the recommended dietary allowance (i.e., the daily intake sufficient to meet the requirements of nearly all healthy individuals) of vitamin K is 120 μg in adult men and 90 μg in adult women, but it is much lower in other countries and Europe (including Italy), where, for example, a daily average of ~1 μg per kg of body weight is recommended. The Third National Health and Nutrition Examination Survey set the thresholds of adequate vitamin K intake as 2 μg/die for infants in the first 6 months of life and 2.5 μg/die for infants aged 7–12 months. After this age, the adequate intake progressively increases from 30 μg/die in children aged 1–3 years, up to 75 μg/die in adolescents (up to 18 years old). While vitamin K1 is commercially manufactured for medicinal use under several brand names (Phylloquinone®, Phytonadione®, AquaMEPHYTON®, Mephyton®, Konakion® ), there are three additional synthetic forms of vitamin K (i.e., vitamin K3, K4, and K5), which are used in many areas including the pet food industry (vitamin K3) and to inhibit fungal growth (vitamin K5). A water-soluble preparation of vitamin K3 (menadione) is also available for adults. The vitamins belonging to the K group are involved in the carboxylation of glutamate residues in proteins, to form gamma (γ)-carboxyglutamate residues (Gla-residues), typically located within Gla domains. These Gla-residues, which are usually involved in calcium binding, are essential for the function of most – if not all - known Gla-proteins. Vitamin K is essential for the function of several proteins involved in blood coagulation (prothrombin, also know as factor II, factors VII, IX, and X, protein C, protein S, and protein Z), bone metabolism (osteocalcin, periostin and matrix Gla protein), as well as vascular biology, cell growth, and apoptosis (growth-arrest-specific gene 6 protein). A poor vitamin K status is, therefore, currently regarded as a risk factor not only for bleeding, but also for increased postmenopausal bone loss and arterial calcification, especially in diabetics and in patients with chronic renal disease. The pivotal importance of vitamin K in haemostasis arises from the fact that all vitamin K-dependent coagulation factors require γ-carboxylation of glutamic acid residues at their Gla domains to enable binding of calcium and attachment to phospholipid membranes. This enzymatic reaction is catalysed by a microsomal, vitamin K-dependent enzyme, γ-glutamyl carboxylase, which in turn is linked to a cyclic salvage pathway known as the vitamin K epoxide cycle. This carboxylation process necessarily requires a functional vitamin K cycle to produce the active vitamin K co-factor (vitamin K quinole) for the γ-carboxylase which post-translationally modifies the precursors of the vitamin K-dependent proteins. When the cyclic inter-conversion of vitamin K to its 2,3 epoxide is blocked, as in the case of oral anticoagulant therapy with coumarin derivatives, the net effect is the appearance in plasma of coagulation factors called PIVKA (Protein Induced by Vitamin K Absence), which are virtually non-functional for the clotting process. Vitamin K deficiency is a form of avitaminosis resulting from insufficient vitamin k.
As previously described, only a very small amount of vitamin K is necessary for blood coagulation in humans. Dietary deficiency of vitamin K is, therefore, extremely rare in adults, and, when it does occur, it is usually associated with profoundly inadequate dietary intake, intestinal disorders (e.g., regional enteritis, cystic fibrosis, intestinal resection), malabsorption and, to a lesser extent, decreased production by normal flora (e.g., during the use of a broad spectrum antibiotic) and renal failure. Vitamin K deficiency is, however, much more frequent in neonates, due to both endogenous and exogenous deficiency. The former case, which is probably less clinically significant, has been attributed to insufficient intestinal colonisation by bacteria, whereas the latter case arises from poor placental transport of the vitamin and its low concentration in breast milk. The main exogenous source of vitamin K in neonates, which is almost exclusively milk, cannot adequately compensate for deficient endogenous production, since human breast milk contains between 1 and 4 μg/L of vitamin K1 (and a much lower concentration of vitamin K2). As in other circumstances in science and medicine, there is an apparent paradox in haemostasis in neonates in that prolonged global coagulation tests (i.e., activated partial thromboplastin time and prothrombin time) do not translate into a particular bleeding phenotype. In fact, it is now clear that the physiology of haemostasis in childhood differs considerably from that in adults. Studies in humans and animals clearly indicate that coagulation factors in neonates are qualitatively similar, in terms of molecular weights and degree of glycosylation, to those in adults. The greatest difference between the two age periods is quantitative, with plasma levels of many coagulation factors being different throughout childhood from those found in adults, with some of the deficits being attributed to vitamin K deficiency. As previously highlighted, neonates are prone to vitamin K deficiency due to the limited stores at birth and insufficient intake. Vitamin K deficiency-related bleeding (VKDB) is defined as a bleeding disorder in which the coagulation is rapidly corrected by vitamin K supplementation. The diagnosis is suggested by an international normalised ratio =4 or a prothrombin time =4 times the control value in the presence of a normal platelet count and normal fibrinogen level. Confirmation of the diagnosis requires measurement of the specific vitamin K-dependent factors (II, VII, IX, X) whose levels are rapidly corrected by the parenteral administration of 1 mg vitamin K.
•	in secondary VKDB there is usually an underlying cause, such as the effect of drugs that have been given to the mother or infant or a hereditary hepatobiliary/malabsorption disease (e.g., biliary atresia, a-1-antitrypsin deficiency, cystic fibrosis). In addition, autosomal recessive vitamin K-dependent coagulation factor deficiencies (VKCFD), due to mutations in the gene encoding for g-glutamyl carboxylase (VKCFD type I) and in the gene encoding for vitamin K epoxide reductase (VKCFD type II), have been reported. •	early VKDB presents within 24 hours of birth and is almost exclusively seen in infants of mothers taking drugs which inhibit vitamin K. These drugs include anticonvulsants (carbamazepine, phenytoin and barbiturates), antituberculosis drugs (isoniazid, rifampicin), some antibiotics (cephalosporins) and vitamin K antagonists (coumarin, warfarin). The clinical presentation is often severe with cephalic haematoma and intracranial and intra-abdominal haemorrhages. The incidence of early VKDB in neonates of mothers taking these drugs without vitamin K supplementation varies from 6% to 12%. •	classical VKDB occurs between 24 hours and 7 days of life and is associated with delayed or insufficient feeding. The clinical presentation is often mild, with bruises, gastrointestinal blood loss or bleeding from the umbilicus and puncture sites. Blood loss can, however, be significant, and intracranial haemorrhage, although rare, has been described. Estimates of the frequency vary from 0.25% to 1.5% in older reviews and 0–0.44% in more recent reviews. •	late VKDB is associated with exclusive breast-feeding. It occurs between the ages of 2 and 12 weeks. The clinical presentation is severe, with a mortality rate of 20% and intracranial haemorrhage occurring in 50%. Persistent neurological damage is frequent in survivors. In fully breast-fed infants who did not receive vitamin K at birth, the incidence is between 1/15,000 and 1/20,000. Babies with cholestasis or malabsorption syndromes are at particular risk. Treatment for this desease consists of vitamin K supplementation. This is often given prophylactically to newborns shortly after birth.